David Berkowitz (David Richard Berkowitz) is an American serial killer that was born on June 1, 1953 in Brooklyn, New York. His birth name is Richard David Falco, and he is also known as the Son of Sam and as the .44 Caliber Killer. David"s mother, Betty Broder grew up in the Jewish religion and married Tony Falco, who is an Italian-American Catholic. Betty and Tony had a fish market that they ran together but separated before David was born because Tony was in love with another woman and Betty had an affair with real estate agent, Joseph Kleinman after Tony left her. Betty became pregnant with married Joseph"s baby, and he did not like that. He threatened Betty that he would leave her if she kept the baby, so she claimed that the baby was Tony"s and put the baby up for adoption. Pearl and Nathan Berkowitz were a Jewish-American couple from the Bronx, who could not have kids. They were hardware store retailers and adopted David a few days after his birth. They gave him their surname, and he was known as their only son, David Richard Berkowitz. David got into trouble at a very young age because he lost interest in education and turned to petty larceny and pyromania. People who knew David refer to him as spoiled, difficult, being a bully and changed dramatically after his adoptive mother died from breast cancer when he was fourteen years old. His adoptive father remarried, and David did not like his new stepmother at all. He joined the US Army in 1971 when he was eighteen years old and served in the United States and South Korea. He tracked down his birth mother, Betty after he had an honorable discharge in 1974 from the US Army. They met a couple of times before Betty discloses to him who David"s real father was and why he was put for adoption. David was angry because his father is dead, and there is no way he can get to know his real father now. He stopped keeping in contact with his mother Betty but stayed in touch with his half-sister, Roslyn. David appeared as an ordinary guy with several blue collar jobs. He was a letter sorter for the U.S. Postal Service when he was arrested for his shootings. He was convicted of multiple shootings beginning in the summer of 1976. He killed six people with a .44 caliber Bulldog revolver and wounded seven people by July 1977. He left several letters stating that there will be more killing that led to a high-speed police chase. New York City police arrested him on August 1977, and he was indicted for eight shootings. He confessed to the shooting and said a demon possessed his neighbor"s dog and then commanded him to kill his victims. David enjoys feeling like a celebrity with all the attention on him from all of the media coverage. New York State legislature then made a new law, known as "Son of Sam laws", which keep criminals/felons from profiting/making money from the media retaining to their crimes. Several other states now have the same law and the law remains active in New York. He is serving six consecutive life sentences. He had once claimed in the mid 1900s that he was a member of a Satanic cult that planned all of the murders because it was part of a ritual murder. He also told the investigators "There are other Sons out there, God help the world." He was sent to a psychiatric ward in Brooklyn"s Kings County Hospital after his arrest, and the staffs said that David seemed normal and not troubled being in there. He was later taken to Sing Sing and then to Clinton Correctional Facility for psychiatric and physical examinations in upstate NY. He had spent two months at the Central New York Psychiatric Center in Marcy before he went to Attica prison. He was moved to Sullivan Correctional Facility in Fallsburg, New York, after serving about a decade at Attica prison. David said that life in jail at Attica was a "nightmare". David stabbed Michelle Forman and another female with a hunting knife. Michelle injuries were serious and she had to go to the hospital whereas the other female was never identified. He moved to an apartment in Yonkers, New York after his stabbing. His first shooting that attributed to the Son of Sam happened in the Pelham Bay area of Bronx, New York around 1:10 a.m. on July 29, 1976. Laura was shot by David after exiting Jody"s Oldsmobile and was killed instantly. He walked away quickly after shooting Jody in the thigh missed both girls on this third shot. Detective determine the weapon used was a pistol chambered for the .44 Special cartridge that is manufactured by Charter Arms. David shot Carl as he was sitting in his car with Rosemary next to Bowne Park, Flushing, Queens. Carl sped off unaware the he was shot in the head and is bleeding. Both survived but could not identified their attacker. A .44 caliber was used. The girls were chatting on the porch of Joanne home in Bellerose, Queens after returning from a movie. David approach the girls on the porch asking for directions and then shooting them. As the girls fell to the floor, he shot them several more times. A .44 caliber was used. Christine died several hours after shots were fired around 12:40 am at the car she and fiance John was sitting in. about 12:40 a.m. They did not see the attacker/shooter. Columbia University student Virginia was walking home from school around 7:30 pm when a man confronted her and shot her in the head through a textbook she held up to protect her. Alexander and Valentina were shot twice around 3:00 a.m., while they were sitting in Valentina car near her home. They received three gunshots through their car around 3:00 a.m which struck them but they survived. The shooter was unknown. It was the anniversary of the first .44 caliber shootings and the police were preparing. It was the final shooting from David. Stacy and Robert were sitting in Robert"s parked car in the neighborhood of Bath Beach. A man approached the passenger side of the car and fired four gunshot around 2:35 a.m.while standing about three feet away. He shot Stacy and Robert in the head and then ran into the park. There was many witness that described him and the vehicle he drove. Police eventually found his car on August 10, 1977 parked in front of his apartment, 35 Pine Street in Yonkers. The officers found a rifle in the backseat, a duffel bag filled with ammunition, maps of the crime scenes, and a letter to Sgt. Dowd of the Omega task force threatening him. The officer went to obtain a warrant because having that type of rifle in New york is legal. The officers did not get the warrant when they apprehended him around 10:00 p.m. after he started his vehicle. They found a .44 Special Bulldog in a paper sack and he told the officers "Well, you got me. How come it took you such a long time?" David Berkowitz serial killer is a male serial killer. 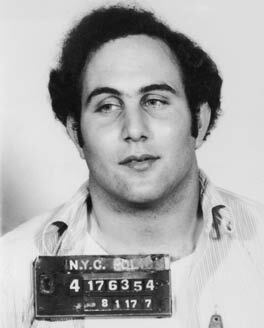 The Son of Sam, The .44 Caliber Killer is a male serial killer. David Richard Berkowitz is a male serial killer.